It won’t surprise you to learn that All British Casino is a celebration of all things, well, British. You’re greeted by a couple of banners when you open the desktop site, as iconic scenes from around the country sit atop a scrolling message saying ‘Great British Excellence’. If you don’t like the British much (please do like us, we’re lovely), then you might want to avoid the site. Otherwise, it’s an excellent place to play your online casino games and has proved a roaring success since its launch back in 2013. Pitched firmly at UK players, but accepting players from around the world, it offers a great variety of casino games and a rewarding loyalty scheme. Just a word on those ‘iconic’ scenes of Britain though. If you aren’t from London, you might feel a bit left out. There aren’t too many landmarks from Wales, Scotland or even lovely Skegness scattered around the site. HOW DOES ALL BRITISH CASINO LOOK? The All British site is sleek and vibrant, combining a beautiful colour palette of red white and blue with sharp and well thought out animations. You will find iconic British landmarks on every page, creating a simple and prideful display of all things British, like Tower Bridge or Big Ben. The site is brilliant in its design, with every page easily accessible from anywhere else on the site. You will find exploring the All British site painless and rewarding, with a full section of helpful FAQs, as well as other pages dedicated to displaying all of the wonderful promotions, news and general information you could need. To top this all off, you can enjoy every aspect of this design and layout from any device, without encountering any performance related issues. The layout of the All British site is elegant yet simple. You will have no trouble seamlessly navigating your way around the place. The design of the casino site is categorised and clearly defined meaning that you can easily find any information you may require at the push of a button. At the top of the homepage, you will see the links to log in or register, which you will find is a straightforward process for both. Upon entering the registration page, you will come across easily identified boxes for your information as well as a postcode finder to help speed the process along. Towards the bottom of the homepage, you will find buttons to take you to whichever page you may need. This ranges from the ‘Terms and Conditions’, to the most current ‘News and Promotion’s, as well as the ‘support’ page. You may also spot a little green box in the bottom right-hand corner, which will put you through to one of the fabulous All British customer support agents for live chat. All British Casino is jam-packed with casino games, hosting over 450 games in total. These games span many different genres, and game software providers too; such as NetEnt, Microgaming, Evolution Gaming Live and Amatic! The All British team are always looking for new games that are worthy of their players, which keeps the whole experience unique and fresh. 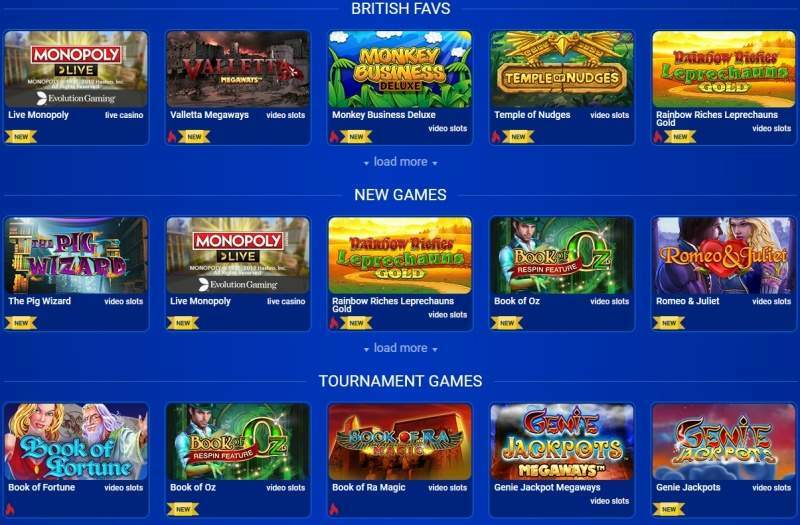 The All British site has a range of diverse games, from retro-styled slots of old to blockbuster-worthy video slots such as Jurassic World. That’s not all as they also provide table games like roulette, Video Poker, Jackpot slots (for which they have their very own, Mega Joker) and a live-link to the Portomaso Casino in Malta for an immersive live casino games experience that is tough to beat. All British Casino no deposit bonus free spins are like free chances from the casino to help you get that big win or go for the jackpot! Slots lovers will appreciate all the free spins they can get from All British Casino to use on their grand games. Free Spins are given to new players as part of the Welcome Bonus, and for ‘Whimsical Weekends’ promotions, regular players can receive even more free spins! Keep on reading to find out more about All British Casino free spins and how you can claim them exclusively through 777 Casino. For more information about this fine UK, casino check our casino reviews section by selecting “Online Casinos” on the top menu bar. All British Casino no deposit deal is an exclusive partnership. Our readers get a whopping 20 free spins on registration. Playing here is like playing in the most glamorous London casino, except everything is much easier to access! You can play at All British Casino on mobile devices, iPads, desktop, tablet or any other connected device you can think of, and there are almost 1000 games to choose from. Online slots from Scientific Gaming, NetEnt, Amatic, Big Time Gaming and MicroGaming are just some of the games providers at this British online casino. If you like the convenience of being able to play from the comfort of your own home (or anywhere, really, thanks to your smartphone) but you miss the real casino atmosphere, you can enjoy live casino from Evolution Gaming. The Evo game catalogue includes Live Roulette and Live Baccarat where you can interact with other casino players and dealers! Seeing as All British Casino is an online casino dedicated to British players, they accept only GBP. You can make real money deposits using many different payment methods, such as Boku, PaySafeCard, Neteller, Visa, MasterCard, Skrill and Bank Transfer. Sign up through 777 Casino and enjoy a bally, British bonanza full of free spins! Licensed with the UK Gambling Commission and Malta Gaming Authority (MGA) we think AllBritishCasino is one of the finest casino sites to play online slots, live casino or progressive jackpots. Firstly, we cant call them free spins. They are bonus spins due to the wagering requirement. Anyway, how does a 20 bonus spins on Starburst no deposit required offer sound? Too good to be true? Well, we have just entered an exclusive partnership offering our readers a top notch casino welcome bonus. To register for an account at All British Casino, just follow the link from 777 Casino! You only have to enter a few details (like your name and your e-mail address) – it’ll take no more than a minute, and then upon registration, you can claim 20 no deposit bonus spins. The All British Casino free spins are for use on blockbuster NetEnt slot Starburst. This is an exclusive offer valid only through 777 Casino – no bonus codes needed. The 100 free spins offer is no longer available in the UK. If you deposit £20 (or more), you will get a 100% Bonus up to £100. All British Casino bonuses come with a wagering requirement of x35. The wagering requirements need to be settled within 30 days before you can play in the live casino or make a withdrawal request of your real money winnings. Slots, Video Slots, Lottery Games and Other Games count 100% towards wagering requirements. Table Games and Video Poker Games count 10% towards the wagering requirements. There’s also an All British Casino promo called ‘Whimsical Weekends’. Every week there’s something for regular players to claim. If you’re a registered player at All British Casino and you play for real money, you can partake in the promotion and redeem the Whimsical Weekend bonuses. Sometimes they can be cash back or reload bonuses, but often they are free spins! All you have to do is sign up through 777 Casino and play for real money. Then you can claim the Whimsical Weekends promotions free bonus every time they are on offer, and you do not need to enter a casino bonus code. The free spins are usually claimable for two days (Fridays and Saturdays) and are playable on a selected game. New games, popular games and seasonal games all feature in this free spins promotion! Now you’ve read the rather britlicious (see what I did there) bonus offer you’d probably like to know how about their payment methods. Like their selection of games, AllBritish Casino accepts the major deposits and withdrawals payment methods. Players can use Visa, Mastercard, Skrill, Neteller, paysafecard, debit cards and Bank Transfer. There is a £20 minimum withdrawal limit and a daily upper withdrawal limit of £5000, and they aim to handle bank withdrawal requests within 24 hours. WHY BECOME A REGULAR AT ALL BRITISH? In an industry which can feel like it is overflowing with choices, All British stands out from the rest for a plethora of reasons. All British Casino have combined an unparalleled level of customer service with an extensive range of games, frequent promotions, and a truly-British theme to make a casino which rewards loyalty and is continuously evolving to the benefit of every type of player, whether a high-roller or not. Being a regular player with All British means you will receive an impeccable service with regards to customer support, rewarding opportunities and promotions, as well as a caring environment, developed to ensure the safety of every player. The size of the support team means that you can easily establish bonds with the staff, creating a pleasant and enjoyable atmosphere. They are all native English speakers too! The All British site is also mobile, meaning you can take your gaming with you on the move, wherever you may decide to go. The games are not limited to the mobile version, with more than 150 games available to be played with no performance drops from the mobile version of the site, no apps or downloads needed! You will also find that the excellent design and layout of the site is not affected, you will always have a smooth and effortless experience while playing any of the classic slot games, table games or even parts of the Live Casino. Furthermore, you will also find that all of the bonuses, complementary spins and offers provided from All British, (for which there are many) will work just as well on mobile devices. There is no downside whether playing on any device, from your phone, tablet or computer alike. Our All British Casino review is positive isn’t it! We think it is an outstanding, user-friendly site which caters to all players. They are registered with the UK Gambling Commission and the Malta Gaming Authority (MGA). Their British-niche adds a pleasant atmosphere to their brand. Their helpful and professional support team are all native English speakers and will stop at nothing to help you in any situation. They will be there to let you know important information proactively to ensure you are always kept in the loop. The huge selection of varied titles will keep you entertained for an age, and considering that they are adding on new additions all of the time, it is a brand that keeps on surprising us. The frequent and generous promotions offered are excellent and are matched only by their equally excellent low wagering requirements. If you are looking for a casino which rewards loyalty with loyalty, you are in the right place with All British. Be the first to review and rate All British Casino!